Raji akka is known for her sense of humour and being there for customers. She may not have fancy gear or Wifi, but let her know in advance and she'll be able to pick you up even late at night! Recent incidents (according to a report published by The News Minutes) have made women rethink traveling alone at night. A huge chunk of auto drivers are male, and after 8 pm some of us think twice before booking an auto; I know I do. 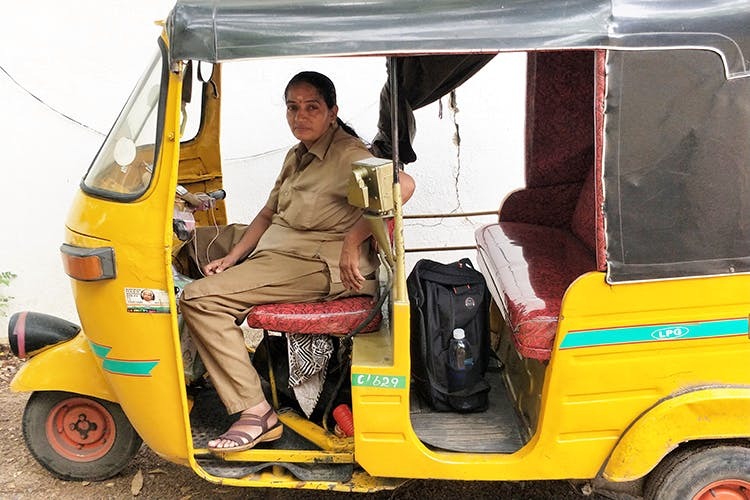 Raji akka knows how unsafe women sometimes feel with male auto drivers and has been driving for 20 years, making sure that women get home safe at night. It’s never about the money for akka, she even gives free rides to children and older citizens. Hailing from a family of auto drivers and residing in Perambur, akka takes great pride in doing her job. Apart from Uber, she rides the streets at night helping women who are alone. If you need a ride back home from work call the Autokaari who knows all the routes at 9965066712. Just let her know at least a few hours or preferably a day in advance, and she'll let you know if she's available.